Dissolve the Jell-O in 2 cups boiling water. Add 1 pint sherbet to the Jell-O-water mixture. Stir well and add the can of pineapple with juice. Pour into mold and chill until firm. 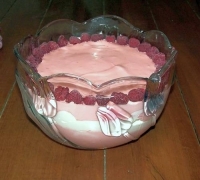 Recipe categories: Desserts, Gelatin, Raspberries.